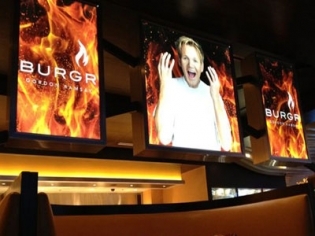 Taking the traditional fries, burger and milkshake to a new level, Gordon Ramsay Burger is the only restaurant on the Strip to cook the burgers over an open flame fueled by hardwoods. This creates a powerful complex flavor in the fresh, high-quality ingredients. The fries are triple-cooked from Kennebec potatoes resulting in a light crispy fry that partners expertly with the chipotle or curry ketchup. The specialty menu is rounded out with Devil Dawgs, chicken sliders and Ramsay’s famous sticky toffee pudding. The menu features an extensive beer list with over 30 craft beers dispensed from a frozen tap wall. Pudding shakes are creamy hand-spun treats topped with intensely flavored pudding. A cocktail program highlights Natural Energy cocktails with green coffee extract to provide a boost of energy. 16 big screen TV’s line the curry and red walls; flame graphics and a large photo of the shouty man himself adorn the same walls. Always a nice place to enjoy a good burger. The onion rules are great too! Was very excited to eat at Gordon Ramsay’s BurgGR, our group got a little before opening so even though we had to wait in line, it wasn’t for long! We started off with Onion Rings which were some of the best I have ever eaten. Loved the cheese-ranch dip especially. I ordered the all American burger, which was awesome, Gordon uses great quality meat. I couldn’t eat my entire meal, and didn’t save room or desert…..dang! Wait staff was very efficient and friendly. Great dining experience would definitely recommend and will go back again! Very good American burger and Hell’s Kitchen burger. Fries were good but different. Service was poor. Was never asked if we needed anything else after our food was delivered. Burgers were very good, but not overwhelming. Service definitely needs work. Mini skirts can’t cover up poor service. If this is the best burgers in Vegas, it’s not saying much. The wait staff were awesome, even when my whole glass of Pepsi hit my lap. The manager gave us free ice cream for my troubles, and it was my fault. The food was a sensory overload. Tasted amazing!!!!!! So much so, neither my fiancee or myself wanted to eat or drink anything later for the sake of the flavor lingering longer. *****Tip: If you order a burger and fries, share the fries! The portions are large. ***** Bon appetite!!! Omg I was so excited to go. The hotdogs are huge. The burgers are juice and the fries are to die for. One place you really need to visit.